Summer may be ending soon, but the warm weather will continue to linger for a few more months. With enough pretty shirts in my closet, I finally summed my courage and motivation to start sewing shorts. I’m really good at turning my husband’s old pants or jeans into shorts, but oddly enough, I only have three pairs of casual shorts and one pair of gym shorts I depend on. I wanted a photo of Kenai with my semi-destroyed sweatpants, but Sophie needed to be part of the picture. 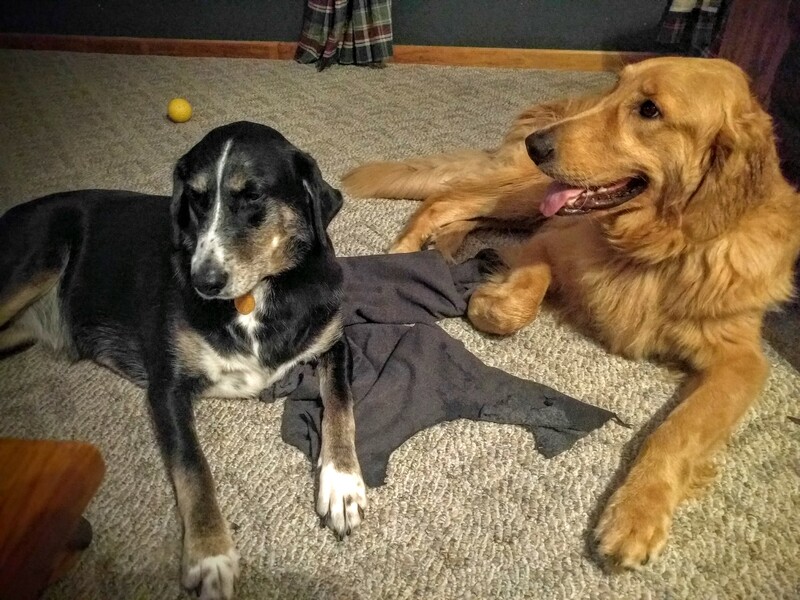 During a recent weekend keeping an eye on three dogs, I had to turn a pair of sweatpants into shorts because I didn’t keep a closer eye on one of the dogs. *sigh* I love Kenai so much — he’s a huge Golden Retriever who has so much energy and love but he likes to chew on towels, socks, sweatpants, etc. I had my back turned when he cleverly started chewing on my sweatpants. Fortunately (? ), he started chewing on the bottom leg of my sweatpants (which I took off to try on some shorts and left off when I worked on the shorts). When I realized I was running around without my sweatpants and Kenai was suspiciously quiet, I discovered the unexpected refashion project. I simply marked my preferred length for shorts and cut off the legs. So, now I have TWO pairs of super comfortable gym shorts that I can around in. Yay! But after rummaging through my refashion bins, I found two pairs of too small sweatpants I could refashion into shorts and make them my size. 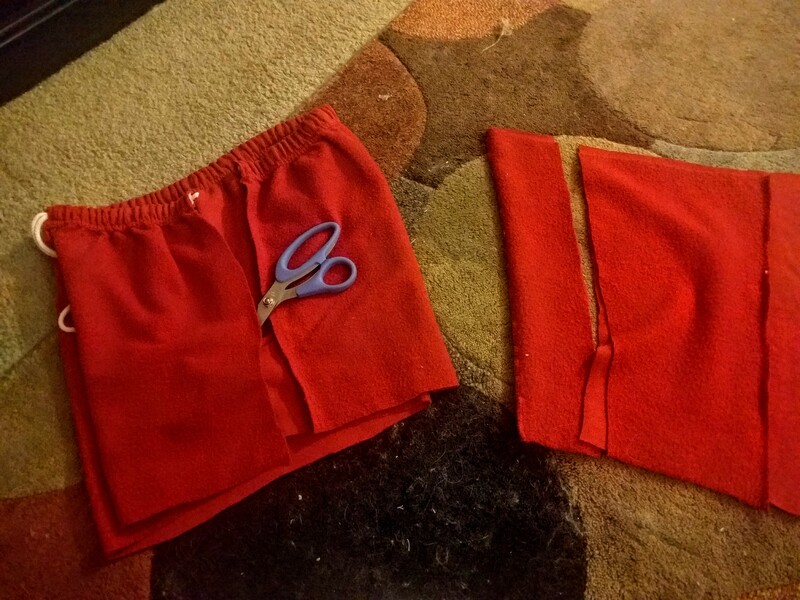 I started with the red pair and cut off the legs at my preferred length, and I inserted a new panel (from the cast off legs) on each side. From the cast off legs, I cut them open and sized it appropriately with an extra inch or two to add to the waistband. 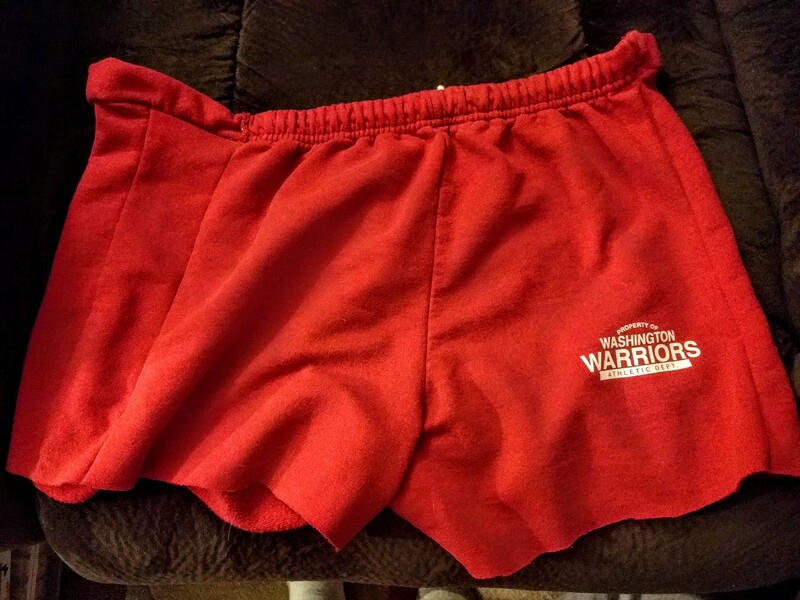 I cut open the side seams on the shorts, including the elastic waistband area, and added about two inches of new elastic to the original drawstrings. 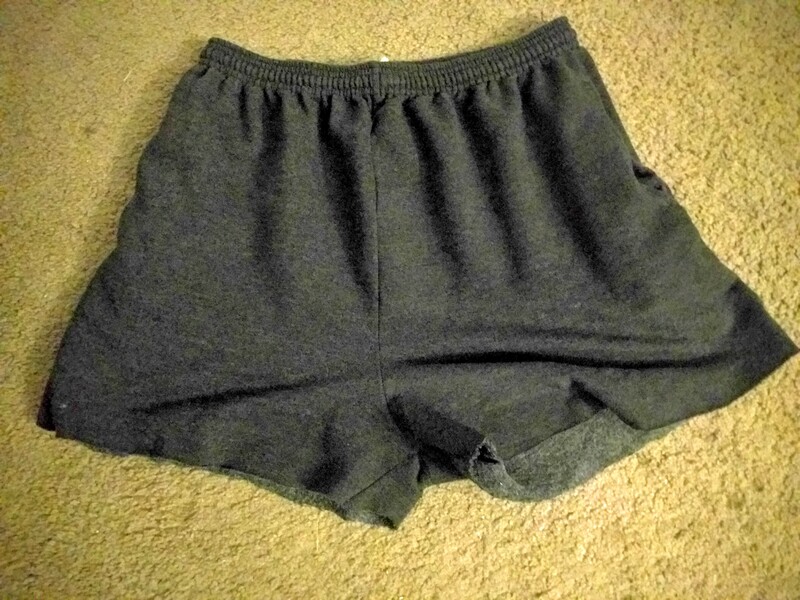 With the sewing machine, I simply sewed the panel sides to the shorts and then hand stitched the waistband closed. The red shorts turned out perfectly! 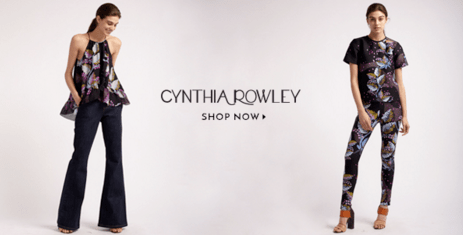 They’re comfy and roomy, and I love them! I can’t wait to wear them all the time. 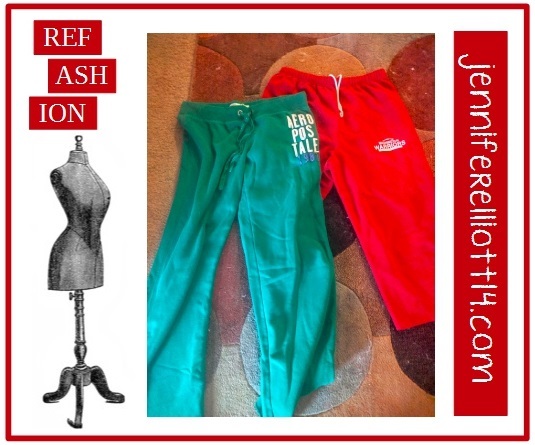 I was just about to follow the same process with the green sweatpants, but when I tried them on, I realized why the sweatpants were in the refashion bin in the first place. Waistband was way too low for my preference. The sweatpants were tossed in a new bin: the donation bin. 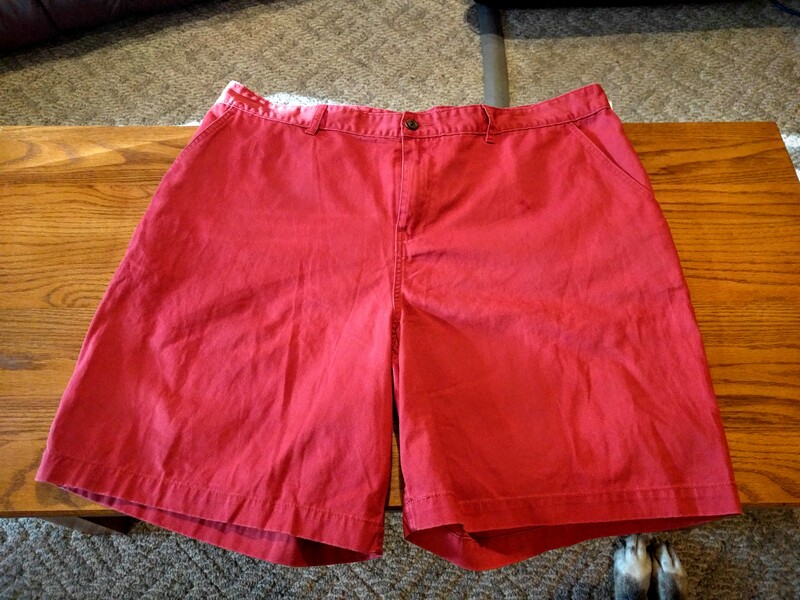 Next up is a pair of men’s red shorts I found for a $1. I love the color, but the shorts are too big and too long. The first step was sewing new side seams, whittling off a few inches on the waistband. The second step was sewing a new inseam because the crotch area was way too long and baggy on me. After that I cut off an inch or two from the legs and created and sewed down the cuff. 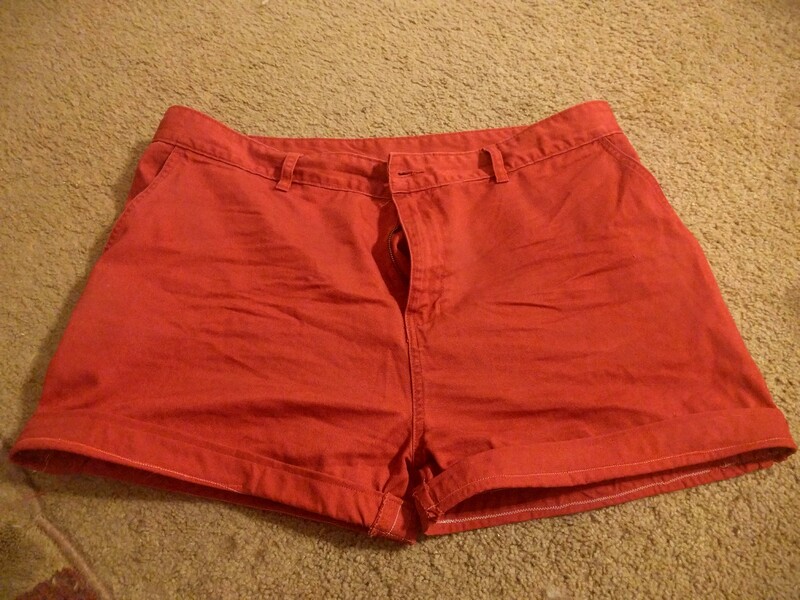 Just like that I have another pair of casual shorts I can add to my small stack of shorts! Yay! I’m really happy with the color red because I have a few shirts with hints of red that will complement the shorts. Now with a few more gym shorts and casual shorts on hand, I just hope the warm weather sticks around for a little bit longer … just a little bit. If I had my way, I would live in sweatpants and sweatshorts all day long. So comfy. Who can be mad at those sweet faces? At least you were able to turn the sweatpants into shorts — that’s always a win. P.S. Sophie and Kenai are beautiful! Love them.